← Sheet Pan Asian Chicken Drumsticks with Broccoli & Spiced Walnuts. Preheat oven to 425°F, position a rack in the center position and another in the bottom position. Line two sheet pans with aluminum foil (optional). Peel and mince the garlic. Peel and mince or grate the ginger; transfer to a large bowl. Add soya sauce, sesame oil, honey, and chili-garlic sauce to the bowl and whisk together. Add the chicken drumsticks and toss to coat. Spread chicken out in a single layer on a prepared sheet pan. Place on the bottom rack of the oven and roast until the chicken is cooked through (20-25 minutes). Wash broccoli and cut into small, bite-sized florets. Thinly slice the thicker stem portions. Transfer to a medium bowl. Toss broccoli with soya sauce and sesame oil. Spread out in a single layer on a sheet pan and place in the oven for 5-8 minutes while you prepare the nuts. Remove the chicken from the oven. Use tongs to flip each drumstick. Spoon on remaining marinade, and return to the oven. Roughly chop walnuts. In a small bowl, toss walnuts with water to moisten. In a small bowl, stir together sugar, cinnamon, and cayenne pepper. Toss moistened walnuts in the spice mixture. Remove the broccoli pan from the oven and sprinkle the walnuts on top. Return the pan to the oven for an additional 5-8 minutes or until broccoli is tender-crisp, and walnuts are toasted. 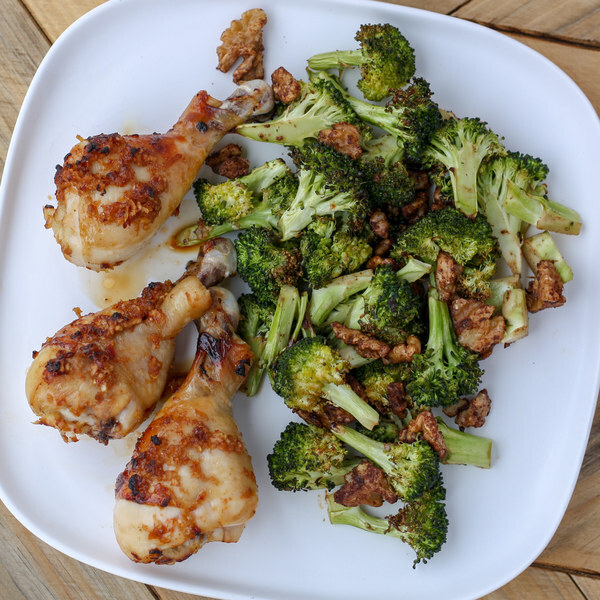 To serve, arrange chicken, broccoli, and walnuts on a plate. Enjoy!